The waters around Cornwall are a hotspot for whale and dolphin activity in the UK, and is home to a healthy population to the globally rare Grey Seal. 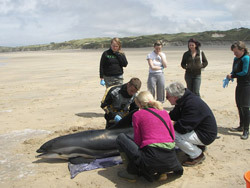 But as a result we get a large number of marine life stranding on our beaches, and we need your help. There are a number of fantastic organisations operating in Cornwall to rescue live and record dead strandings, so if you ever see any marine life washed on on our shores please call the appropriate Marine Emergency Contact as soon as possible. Please remember never to approach a stranded marine animal (alive or dead), as they are wild animals in distress and will bite or can may carry diseases which can harm you. Who to call when you see a stranded marine animal? Who to call if you see a marine animal being Disturbed or Harassment! Reports should be supported by photos and videos if possible.